Two very important aspects of a healthy lifestyle are a nutritious diet and regular exercise. A nutritious diet is defined as one that is balanced, but what does this mean exactly? While we might think of a balanced diet as one that includes a variety of foods, a balanced diet is meant to provide the appropriate amount of caloric energy needed to maintain the body’s energy balance. Energy balance means that daily caloric intake is equal to the calories utilized by the body to maintain proper function. A balanced diet should be high in essential nutrients found in whole foods, including fresh vegetables and fruits, legumes, nuts, proteins, healthy fats, and complex carbohydrates, and low in undesirable high sodium processed foods, unhealthy fats, junk foods, and sugar. 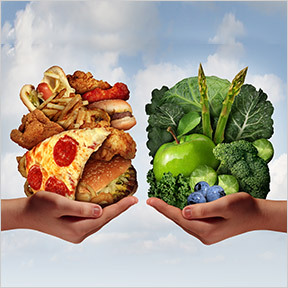 Why is a balanced diet so important for health? While occasional indulgence of low-nutrient foods may not be problematic, even a short term unhealthy diet can have negative health consequences. Unhealthy eating means consuming excess calories, consuming empty calorie foods that have little or no nutritive value, and consuming foods known to be hazardous to health, such as fried foods, sugary drinks, and low fiber highly processed foods. While a balanced diet includes foods that provide the most nourishment for the calories they contain, an imbalanced diet may result in nutritional deficiencies, weight gain, and a compromised immune system. Without proper nutrition, the body is prone to infection, fatigue, disease and poor performance. The core of a balanced diet includes foods that are low in unnecessary sugars and refined carbohydrates and high in whole food nutrients. Brain function – The brain requires sufficient nutrients, such as glucose, healthy fats and antioxidants, for nourishment and normal functioning. A diet lacking in proper nutrients can result in reduced alertness, as well as poor memory and concentration. While vitamins, minerals, fatty acids and phytonutrients may protect memory and slow age-related cognitive decline, a diet high in processed foods and sugars is associated with inflammation, oxidative stress and accelerated cognitive decline. Energy – A balanced diet keeps energy levels steady, while sugary and refined foods provide a burst of energy followed by an energy slump. Poor diets are often deficient in nutrients and enzymes that support mitochondrial energy production and oxygen transport, such as B vitamins, CoQ10 and iron. Inadequate nutrients can result in poor muscle strength, endurance, and coordination, as well as physical weakness. Mood – A healthy diet can support memory, balance brain chemistry, and stabilize blood sugar. Blood sugar spikes and crashes are associated with mood swings, crankiness and depression. Good nutrition is necessary for the production and proper function of brain chemicals, such as serotonin and dopamine, that promote positive mood and regulate sleep. Sleep – Good nutrition aids the production of neurotransmitters necessary for adequate sleep and provides the nutrients that build amino acids also involved in sleep. Studies show that eating less fiber and more unhealthy fats and sugars during the day may result in interrupted less restorative sleep. Poor sleep patterns are linked to higher rates of obesity and metabolic diseases, while good nutrient choices can optimize circadian rhythm and keep all bodily functions running on schedule. Skin health – We may not think about feeding our skin, but those who want healthy, glowing skin should optimize their nutrition and hydration. Nutrient dense foods supply the vitamins, minerals and amino acids needed to build the collagen and elastin that keep skin strong and supple. Sufficient protein is essential for repair and replacement of new, healthy skin cells. Foods high in antioxidants help protect cells from sun damage and fight free radicals that break down collagen over time. A diet rich in vitamins, A, D, C and E as well as phytonutrients appears to have a beneficial effect on promoting and protecting skin health. Digestive discomfort – Digestive distress can be a sign of a low dietary fiber intake. Whole foods rich in soluble and insoluble fiber keep the digestive system running smoothly and support balanced healthy microflora. Poor digestion can wreak havoc on the body, mood and sense of wellbeing. Elimination of chemical laden, highly processed foods and sugars can help keep gut microflora healthy and well-balanced, thereby reducing discomfort and improving nutrient absorption. In the long term, eating a balanced diet, engaging in regular exercise and maintaining a proper weight can add healthy years to your life and reduce the risk of certain diseases including cancer, diabetes, cardiovascular disease, osteoporosis and obesity. In the short-term it can also make you feel and look your best, give you more energy, improve sleep and digestion, and help maintain a healthy weight. CoQ10 100 mg by Professional Supplement Center: This product supplies highly bioavailable CoQ10, an important antioxidant that aids carbohydrate metabolism, oxygen utilization and cellular energy production. Gluten free, Non-GMO vegetarian formulation. DFH Complete Multi™ with Copper (Iron-Free) by Designs for Health®: This full-spectrum multivitamin with Albion chelated minerals provides highly absorbable bioavailable nutrients in support of optimal wellness. Enzyme Nutrition™ Multi-vitamin for Men by Enzymedica: Designed to meet the unique needs of men, this whole food multi contains Enzyme Activated Nutrients™ plus Thera-blend™ enzymes that enhance the utilization of the nutrients. The formula also includes certified organic superfoods and botanicals as well as guaranteed potency probiotics. Gluten, wheat, dairy, soy, preservative and artificial ingredient free, Non-GMO formulation. Also available: Enzyme Nutrition™ Multi-Vitamin for Women. Digestive Enzymes Ultra by Pure Encapsulations®: This high-strength mixture of vegetarian enzymes supports enhanced protein, carbohydrate, fat, fiber, and dairy digestion, and promotes optimal nutrient bioavailability and absorption. Gluten free, Non-GMO, hypoallergenic vegetarian formulation. This entry was posted in Home and tagged A healthy, Brain function, CoQ10 100 mg by Professional Supplement Center, DFH Complete Multi™ with Copper (Iron-Free) by Designs for Health, Digestive Enzymes Ultra by Pure Encapsulations, energy, Enzyme Nutrition Multi-Vitamin for Men by Enzymedica, Health or Consequences. Bookmark the permalink.